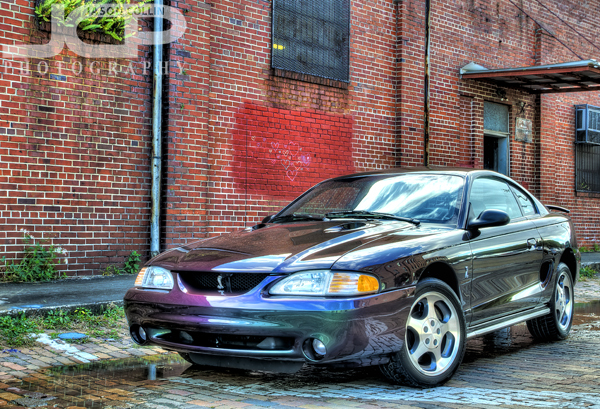 1996 Ford Mustang Cobra mystic color (green purple) in Ybor City Tampa Florida - Nikon D300 Tamron 17-50mm @ f/8 ISO 200 1/125th complex composite of 7 strobist shotsI returned to an Ybor City location I used some time ago to photograph a Lexus IS F. This time I met a client with a 1996 Ford Mustang Cobra in the rare mystic color that can look green or purple depending on the light. The above shot used a new technique that I tried for the first time involving taking many shots as I walk around the car with a speedlight in a brolly. Then all those shots are blended together into a composite showing the best list portions of each one. Afternoon clouds over a Mustang Cobra in Ybor City car photography shoot - Nikon D300 Tamron 17-50mm @ f/11 ISO 200 9-exposure HDRFor this shoot the surrounding environment was really included as-is, which meant the dumpster with graffiti was composed in the frame to contrast with the car, the ominous sky and the distant city skyline. Using a 9-exposure HDR composite allows for shooting into the sun like this. Ford Mustang Cobra car photography shoot in Ybor City Tampa Florida - Nikon D300 Tamron 17-50mm @ f/11 ISO 200 7-exposure HDRMore subjects of varying contrast in this shot starting at the top with the American flag waving coming down to an American icon in the Ford Mustang. The flag was waving but appears without blur in this HDR image because the final step I took in editing was to mask in a single frame of the flag. Highly stylized HDR image of a Ford Mustang Cobra - Nikon D300 Tamron 17-50mm @ f/11 ISO 200 7-exposure HDRIn the above shot you can see some interesting "hearts" graffiti on the brick wall. I wondered who would make such an expression in such a place and thus definitely wanted to feature it in the background of some of the shots. Profile view of a Ford Mustang Cobra - Nikon D300 Tamron 17-50mm @ f/11 ISO 200 7-exposure HDRNo hearts in this rectangle of red graffiti. Maybe a yet to be finished work?